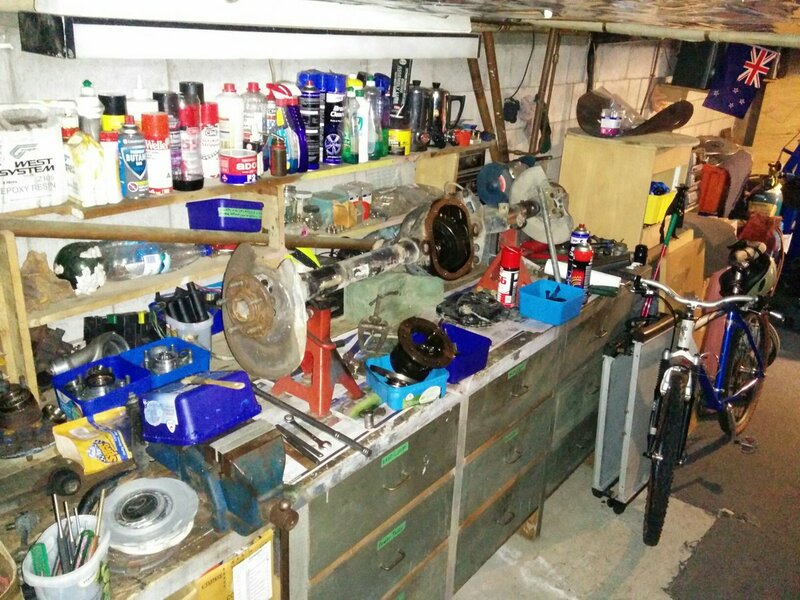 DIYEFI.org Forum - View topic - Fred's Garage - General Comments Here! Fred's Garage - General Comments Here! 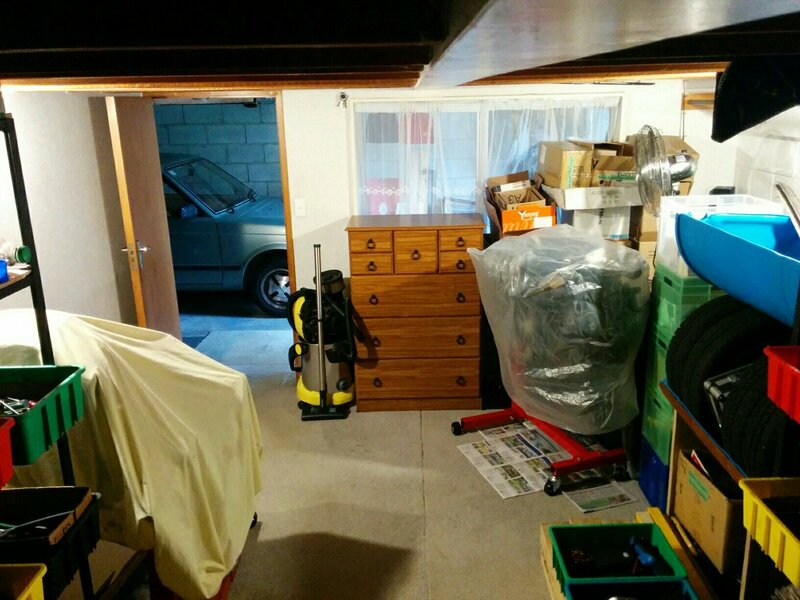 Re: Fred's Garage - General Comments Here! Please inline in the next post including the one of the couch I already inlined above. That white car is a tough nut to crack. I don't recall anything in that shape except some old station wagons and truck bed shells. 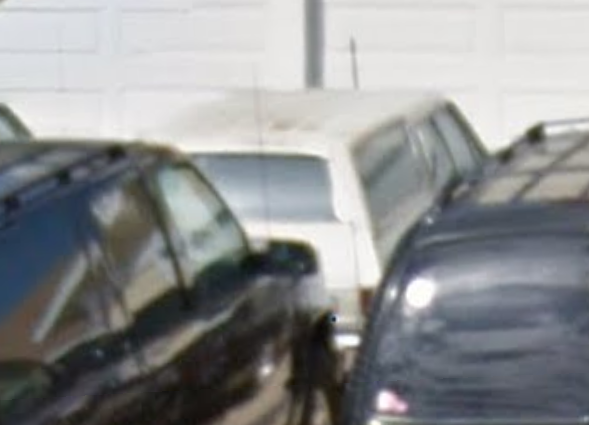 I saw a really, really, strange old school Toyota truck recently with an extended cab and staggered roof line....but what you've posted is odd for a US car. Based on the taillights, I'm guessing 1980s. Got enough spare tires? Any chance we'll see some of these burning rubber? Love those windowed doors. Good solid creeper (I find the more expensive vinyl ones rip apart too easily and are sized poorly). Proper use of a BBQ grill! (Assuming the propane tank in the previous image goes with this.) Good to see some nationalism in there as well as I usually only see US flags with BBQ grills. I worry about putting a computer in my garage due to the sub-freezing temps, but really need one. Awesome welder. Those cabinets are fantastic and that looks like a great workspace with decent lighting for routine maintenance. I'm going to try something like this instead of full-sized cabinets along one wall. Nice vise. What are the green-capped round bottles? Brake fluid? What's in the "Sprite" bottle? Good use of a ute bed. I have a growing collection of transmissions as well. I'm in awe at the sheer number of bins and quality organization you've pulled together. Open trays FTW. 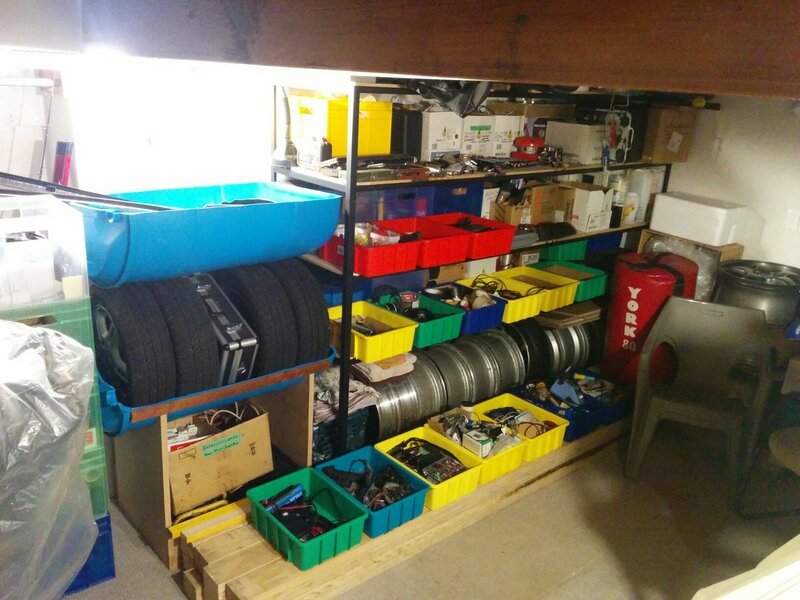 I have closed double-height bins and need to start getting things up on pegboards to make quick-access bins a reality. Awesome wheel and tire storage. And that chopped water barrel is pretty damn clever. I can image using one as a wash basin like that and with the fill hole as a drain at the bottom. Thanks for posting these. Far more organized and functional than I imagined. I believe it's in the range 60-69, but I could be wrong. Any chance we'll see some of these burning rubber? Every chance we'll see all of these burning rubber! This is how I finish off tyres regardless of their former usage. That stack is all Volvo wheels, destined to be destroyed on the 740 once the locker goes in. The two tyres under the drying towel are for the caravan and will not see burnout time. Without them it'd be pretty dark and dingy in there. They're noisy and a minor paint to open, too, but I only one most of the time. Good solid creeper (I find the more expensive vinyl ones rip apart too easily and are sized poorly). Gift from wife on basis of advice from em_knaps who said the alloy ones are no good because??? I can't recall. He had good reasoning, and the couple of times I've used it's been good. I've also used it for moving furniture, but it's not really stiff enough and the wheels aren't up to it either. Did it, though, and survived. What, storing empty oil bottles post Stagea maintenance? :-D There are four 9kg LPG bottles (as we call them here), one in the BBQ, two visible there (one behind wheel stack), and one in the heater upstairs. 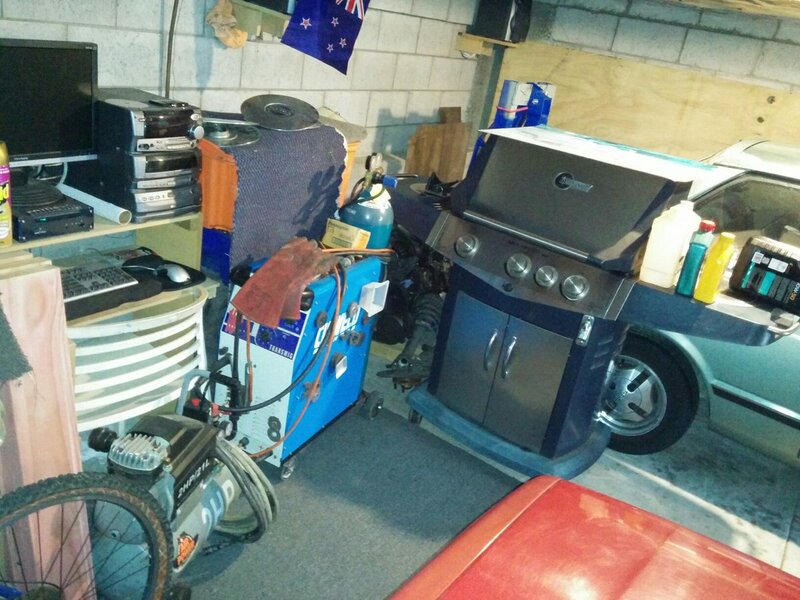 There is also a garage fan gas heater that can heat the whole area in a couple of minutes, but I've only used it a couple of times, and can't currently afford to pour LPG down it so quickly, either. Good to see some nationalism in there as well as I usually only see US flags with BBQ grills. You might recall the flag debacle: https://en.wikipedia.org/wiki/New_Zeala ... E2%80%9316 My neighbour gave it to me at the time and I hung it there. Happy to keep it there, too, mind you. I worry about putting a computer in my garage due to the sub-freezing temps, but really need one. Those cabinets are fantastic and that looks like a great workspace with decent lighting for routine maintenance. Surface is bumpy/irregular as it's roughly made from 3 planks of wood. I'd call it a "work bench with drawers". The drawers also don't slide very nicely, being straight wood on wood, and fairly hefty. It's built into the place, and it took me a while to adopt it and use it. I prefer smoother flatter surfaces. Borrowed/stored for a decade or more, it belongs to my step brother and that's the first time it has been bolted down. It is a great vice, quality, English made, it belonged to his dad. What are the green-capped round bottles? Brake fluid? "bars bugs" washer fluid, purchased on special in bulk, never to pay retain again. I do the same with cereal and toilet paper and other non perishables, stock up heavily when on lowest specials, never buy at full price unless have run out. 7 per 24 for toilet paper last sunday, bought 48, usual prices 10-12. Kellogs sultana bran in the cupboard, 12 or more boxes, bought at 6 bucks a box instead of 8. etc. Brake fluid is the white bottle and black bottles with blue lids to the left of that. Down the bottom is a mostly obscured box of "SCA degreaser" sold at 5 bucks a can, bought at 2 bucks or 2 bucks 50 per can, in bulk. Found it! Umm, not sure. Would have to check :-D Given the location, possibly oil of some type, or coolant, or something nasty to keep away. Cheers! Quite a bit of the organisational stuff is new since I built the shelves for the store room, however the more observant would notice that most of the shallow trays are lined with 15 year old cardboard trays, the lids from 5-ream paper boxes, A4 size, not US letter. IE, I've had the open access tool division system going on for many years, great for sliding around on the ground where you're working outside and not going back for "that other size" or "a longer screwdriver" or whatever. Just take the whole category each time. Almost good. 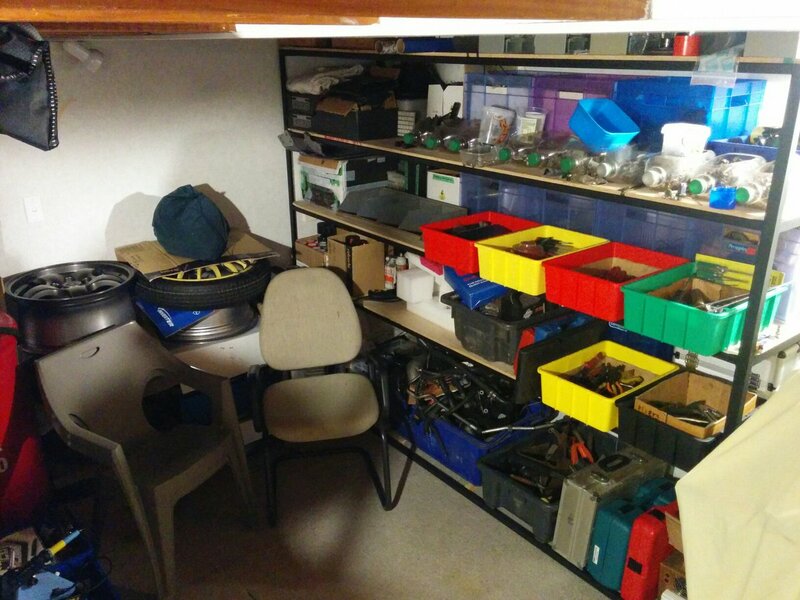 Flaws: Some of the cube bins at the back are frequent use, and should be moved. Sometimes up to 3 trays need to move to get a cube bin out. You've seen that before, here: https://twitter.com/FredCookeNZ/status/ ... 1168941056 sadly, I never uploaded a shot of it full of ice, or with poor keywords. 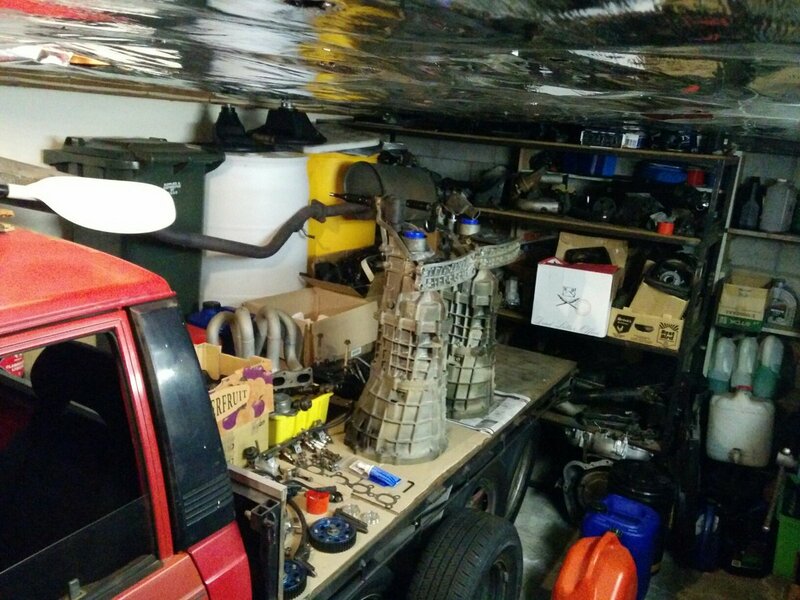 I do plan to use it for a scrub basin for parts cleaning, we talked about this before. But I need a way of keeping the fluid contained as strong smells down there make it up here, which is not good for our health or my marriage. Ha! What did you think I was? Some sort of sloppy slob? 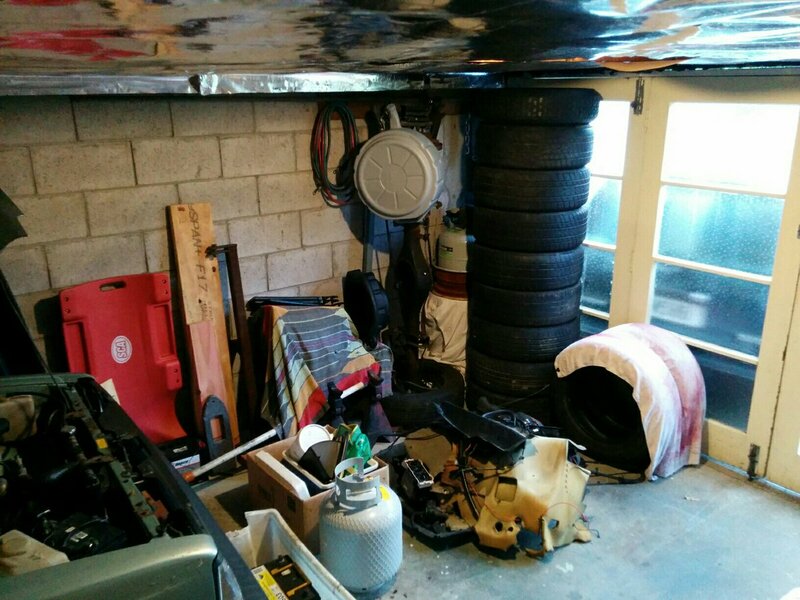 Your imagination probably more closely matched until a few weeks ago when I cleaned up for an inspection. 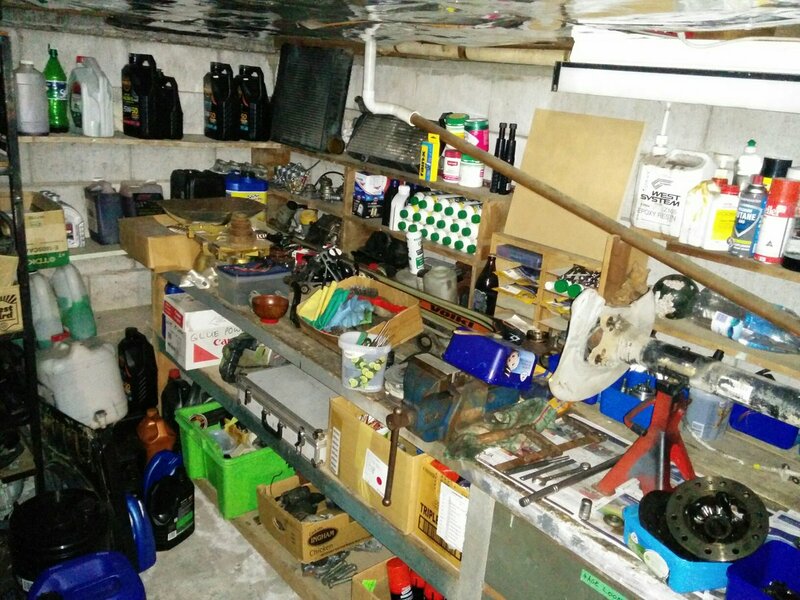 The aisles were full of car parts and tools were not "in their place" etc. The "couch" was covered in random junk. It's better this way, more productive, and I'll try to keep it this way, too. It's pleasant how it is. Not a pain. Hint: they both have some rather grubby looking oil and junk in them. 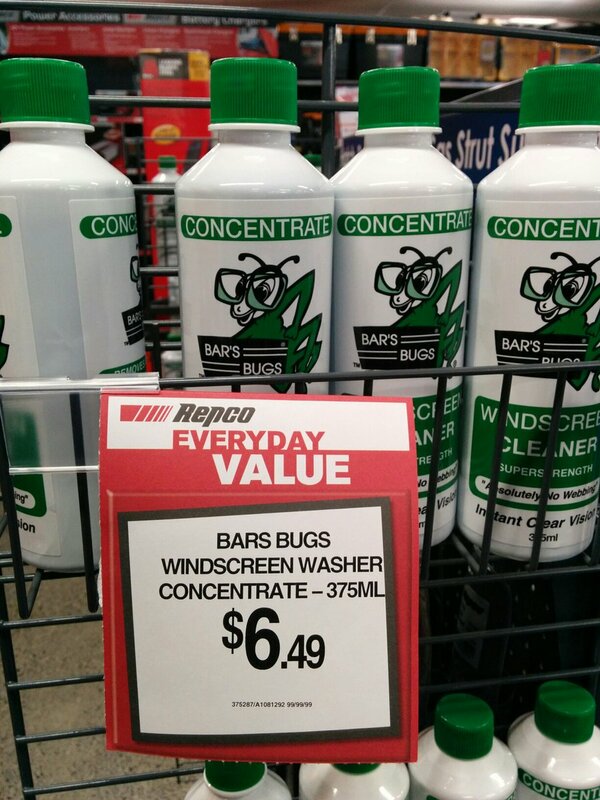 "bars bugs" washer fluid, purchased on special in bulk, never to pay retain again. "6.49 for 375ml, vs the 3.50 I think I paid for the 500ml bottles you saw. Makes sense given the fleet :)"
Thanks for the great photos, explanations, and follow-up comments and shots. Caption: "#KLZE right, lowered crane centre, #B234F left. Ute bits against wall. Where KP?" I must admit I'm quite jealous of the engine availability in Kiwi-land.. KL-ZE and 4AG blacktop are high on my list of engines that I wouldnt mind rocking in the AE86. 680 for the entire Millenia including the KL :-) Got to drive it first, it's in good shape, mostly. 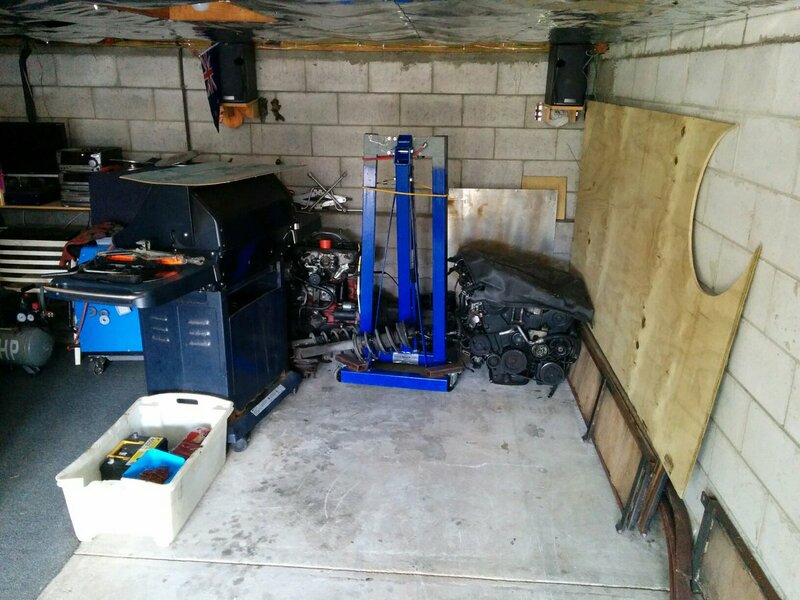 Two J160 six speeds, with cross members, driveshafts, starters, forks, shifters - 800nzd/400euro all up. "The owner wishes to remain anonymous. and has instructed driver to behave in such a way.﻿" ROFL. There might be something of a thread on this thing, or a few posts, somewhere on the forum already IIRC. Not sure where, though. Probably in my ute thread?